Sometimes when I read an item that, to me, feels like a major shift, I figure I’m probably the last to know. 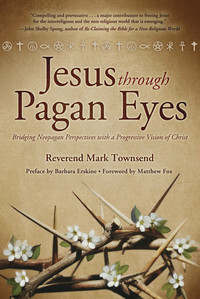 But just in case I’m not, I’d like to introduce you to Mark Townsend, who has just published the book Jesus Through Pagan Eyes. I haven’t had a chance to read the book yet, but from what I’ve read about Mark’s journey here and more insight into the conflict with his own “tribe” (his quotes) here, it sounds like an interesting read, especially for those of us who were raised Christian, and have since broadened our horizons and changed our attitudes towards organized religion, but don’t necessarily want to throw out the baby with the bath water. Mark Townsend is a former clergyman in the Church of England, and is now a priest of the Open Episcopal Church, a member of the Progressive Christian Alliance, and a member of the Order of Bards, Ovates and Druids. I recommend having a look at the links then making up your own mind whether this is something in which you’d be interested.